In the spring of 2009, the owners of a building in south central Chicago's Bridgeport neighborhood sought to have a mural painted on the outside wall of the building as part of an upcoming arts festival. Artist Gabriel Villa devoted two weeks painting a work that he admits was intended to be provocative. 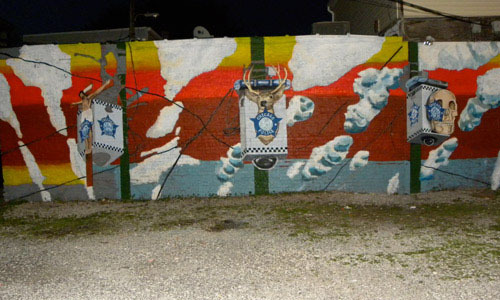 The large-scale mural featured three police cameras, each emblazoned with the Chicago Police Department logo and an unusual icon: a crucified Christ, a deer head, and a human skull. Said Villa, "I wanted to create a platform for dialogue but the mural was never given a chance." 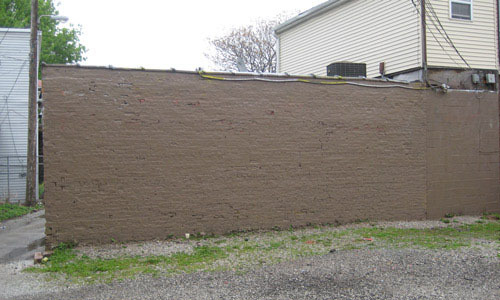 Villa's comment reflected the fact that immediately upon its completion, the mural was completely painted over on the orders of 11th ward Alderman James A. Balcer. Balcer initially explained that his order was not based on the mural's content but the fact that neither Villa nor the building's owners had obtained a permit as required by a local ordinance. "Everyone has a right to their opinion, but there's limits. He has to follow the law, this artist, like everyone else." The problem with Balcer's explanation is that Villa was following the law. News reporters covering the incident soon discovered that a permit was not required for murals on private property. Following this revelation, Balcer's explanation for his actions changed somewhat, implying that he had in fact been motivated by the mural's content. "If it's a threat to this community, I'll take it down. I believe that ... [mural] was a threat." Despite the fact that he was wrong about the permit requirement, Balcer was unapologetic for his action. "I acted on behalf of my constituents who were calling the ward office. I stand by that. I will not back down. I will not retreat." If this were a simple case of a government official misstating a permit requirement, perhaps a Muzzle would not be warranted. But the Alderman's statements imply his actions were justified even if he knew no permit was required. Alderman Balcer is therefore claiming that he has the authority to destroy works of art based on his personal assessment of their content. In fact, the U.S. Supreme Court has clearly established that theAalderman's order is the sort of arbitrary action by government officials that the First Amendment prohibits. For failing to appreciate this constitutional principle and his city's own permit requirements, a 2010 Jefferson Muzzle goes to Alderman James Balcer of Chicago's 11th ward. Way to make Chicago proud, Alderman Balcer.